House with character - "GITE RUBIS". Property 51: House with character - "GITE RUBIS". Property 55: Old vineyard house. Property 76: Near Richelieu - beautiful environment, quiet. 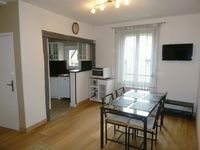 Property 84: "La Porterie" 4**** cottage in a 12th century abbey ! Property 87: La Closerie, lovely house, park of the chateau des Ormeaux, 6 km from Amboise. We had an amazing stay with our most gracious hosts Philippe and Martine! They prepared everything for our arrival and had excellent communications in advance regarding our arrival day and time. The cottage is gorgeous and very well equipped. Filled with light and warmth and very spacious. It was a wonderful retreat for our family. 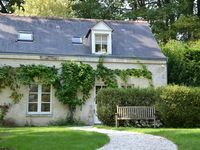 The location of the cottage is perfect for touring the Loire Valley, and the town of Rochecorbon is charming, quaint and quiet but has all of the amenities needed for groceries, bakery, restaurants, walking trails etc. We would highly recommend this property and cannot wait to return ourselves! Very well located for a visit to the Loire valley. Plenty of restaurants around and on a lovely pedestrian street. The steps are a bit steep, but only 2 flights so not a problem unless you have mobility issues. The apartment was clean and comfortable for my husband and I. If you plan on arriving on a Sunday be aware that there is a large (and wonderful) open air market that goes on until 2pm which makes parking challenging. We had no problem finding parking the rest of the week.